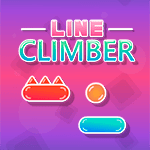 Classic arcade Line Climber, in the style of platformer Doodle Jump. Get to the top and collect all the stars. Jump from one platform to another and avoid the dangerous traps that lie in wait for you at every turn.